"Rowena Creek and Rowena Dell, Oregon"
Click image to enlarge Tom McCall Nature Preserve, Oregon. View looking downstream Rowena Creek at Rowena Dell. Image taken September 18, 2005. Rowena Creek enters the Columbia River at River Mile (RM) 179, just downstream of Tom McCall Nature Preserve and Rowena Crest and upstream of the Oregon town of Mosier. 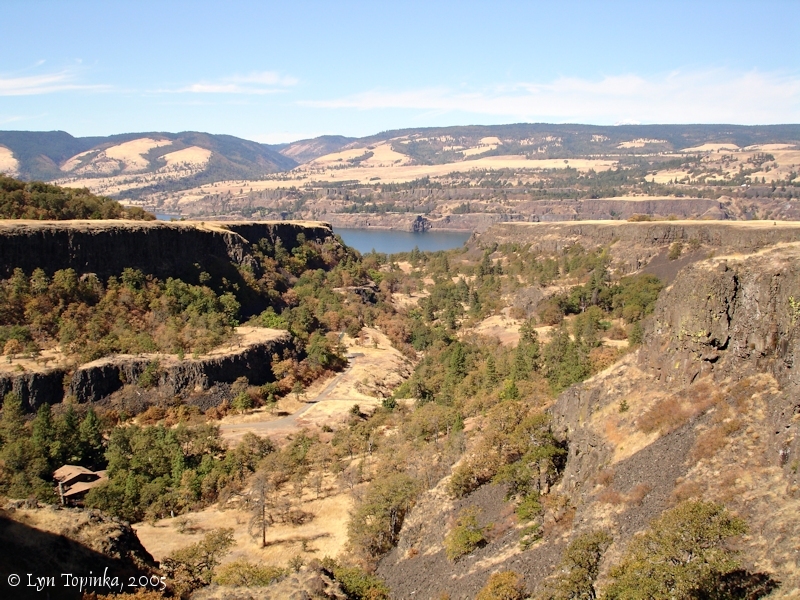 Lyle, Washington and the Klickitat River are across from Rowena Creek on the Washington side of the Columbia. Also on the Washington side are the drainages of Major Creek and Catherine Creek. Rowena Dell is the valley of Rowena Creek. 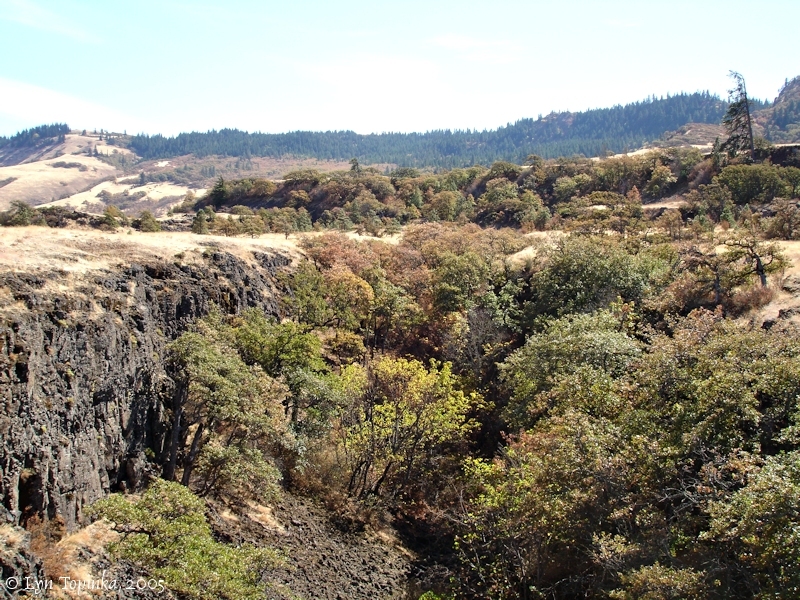 Rowena Dell at one time was called "Hog Canyon" after residents, tired of the rattlesnakes infesting the canyon, fenced the end and turned hogs loose. 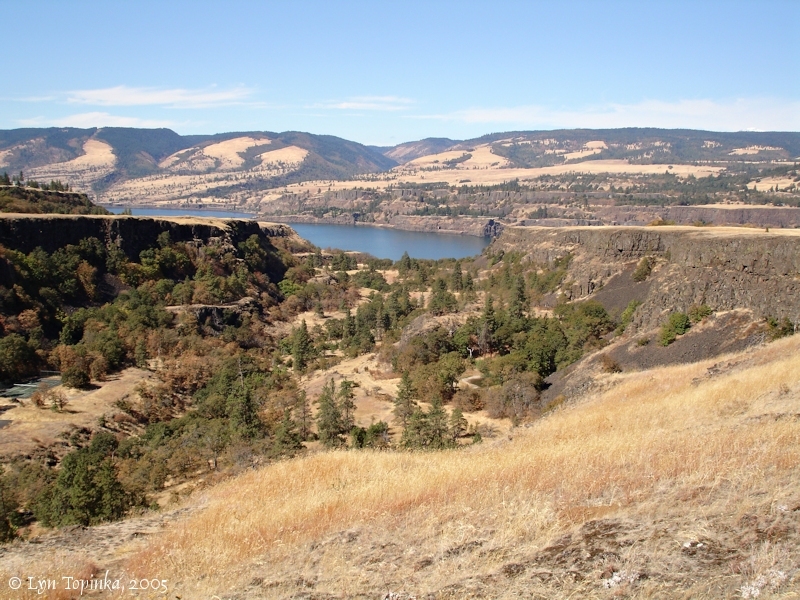 After the Columbia River Highway was built, residents wanted a more "elegant" name and chose "Rowena Dell". Hog Canyon or Rowena Dell? "This canyon, a deep gash in the rock running back from the river, is far more picturesque than its name, which is said to have come down to it through the fact that a man who once lived in the canyon kept hogs. Some months ago members of the wormen's club at The Dalles were commissioned to select a new name for the canyon. Evidently the romanticists prevailed in the club councils, for their choice was "Rowena Dell." The reaction from this has been about as severe if not more so than from "Hog canyon," with the result that in most circles it is still called by the old name." 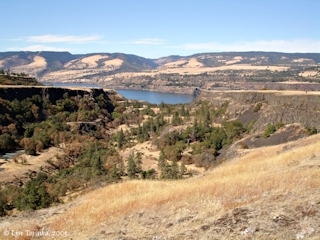 Rowena Dell lies along the Historic Columbia River Highway just east of Rowena Crest. 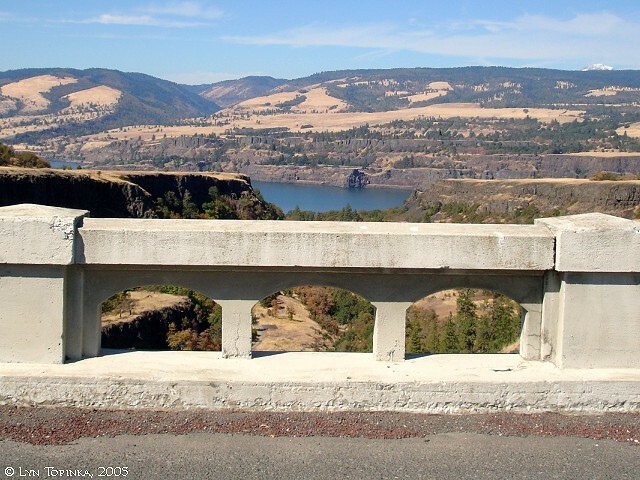 Click image to enlarge Dry Canyon Bridge and Rowena Dell, Historic Columbia River Highway, Oregon. View from bridge on the Historic Columbia River Highway looking downstream towards the Columbia River. Mount Adams, Washington, is on the skyline right. Image taken September 18, 2005. 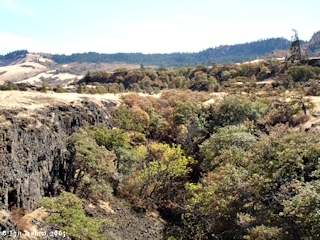 Click image to enlarge Rowena Dell, Oregon, looking upstream. 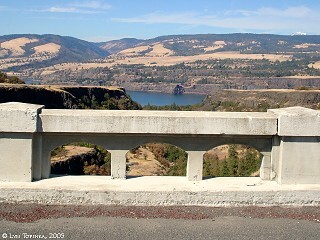 View from bridge on the Historic Columbia River Highway. Image taken September 18, 2005.